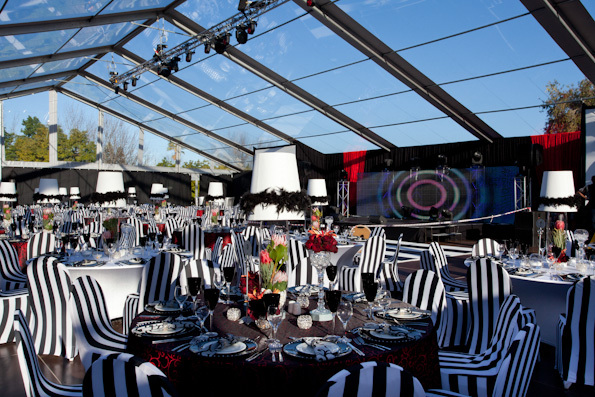 Style is generally of minor concern as in most the hired in tables are covered by cloths. The exception being tall cocktail tables where a metal finish is currently popular. For dining, table size and dimensions are important. Seating groups of 10 is common although with 8 at a table one can converse with the whole group. Round tables are the most popular and ideal for centre pieces. Rectangular tables are best for confined spaces or when one wishes to seat a large number at a single table. Square tables seating 8 or even 12 are also available. Aesthetically it is preferable to have all the dining tables in the venue of the same shape. For receptions and cocktails or “chill areas” a mix and match selection has some support. Cocktail tables are just over a metre high – good for standing around or sitting at for a time for a drink. They are not suitable for meals. When creating a buffet station a rectangular buffet tables are most practical. Consider more than one buffet station when the number of guests exceed 50 in order for all guests to be served promptly. As with most aspects of event planning one should first envisage the practical application of the tables and then only the styling if important.